i grew up riding bmx bikes like a lot of other kids. as i grew older i tried other kinds of bike, but i was still strongly drawn to bmx. i liked the simplicity, ruggedness, versatility, fixability & all-out fun of those great 20" bikes. i think bmx gave me a singlespeed mentality long before 'singlespeed' was the buzzword that it is today. as the years went by, i acquired many different bikes. but in the end i always found myself stripping them of their derailleurs, shifters, cables - even brakes! - because of lack of parts or proper tools or money or sometimes just out of sheer boredom. i remember wondering why a 'mountain bike' couldn't be more like a bmx... my mtb was a great size & the geometry was perfect for flying down tight trails. in fact it was a good deal more rideable than the famed 26" bmx bikes of old! here we are now. i've ridden singlespeed bikes for quite some time...i have some (i do stress *some*) technical knowhow, i have a few bikes to experiment on & i'm ready. i started building an old stratoflight touring bike into a fixed gear... but then one day while browsing for bikes in the local thrift shop i happened upon a sad, rusty, beaten up beach cruiser & i was inspired. i stripped the fenders and chainguard, swapped out the coaster rear wheel for a *found* falcon wheel, built on some old redline bmx cranks & a bmx chainwheel, topped it all off with an old viscount seat & - my favorite! 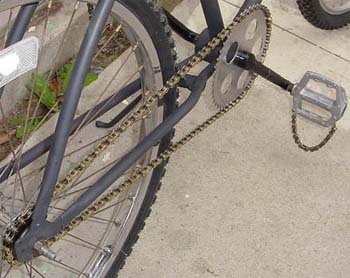 - toe straps fashioned out of bmx chain. 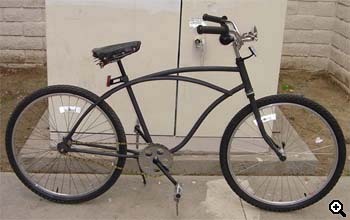 for $20 i have a super sweet fixed cruiser with a new lease on life. so far i have ridden this bike quite a bit and i am enjoying it thoroughly. i am looking forward to getting a large wald delivery basket for the front for my groceries. as much as i like checking out the bikes @ fixedgeargallery.com & 63xc.com's rides section, i love the idea the fixed gear doesn't have to live up to any preconceived notions & that it really can be accessible for everybody... i think you have all done a great job of promoting this feeling.